Once wrestled over like a shiny pearl between Russia and Japan (with the Manchurian government and Chinese citizens caught in the crossfire), the port city of Dalian was the site of 2018’s Dulwich College Shanghai Year 10 Challenge Week program. 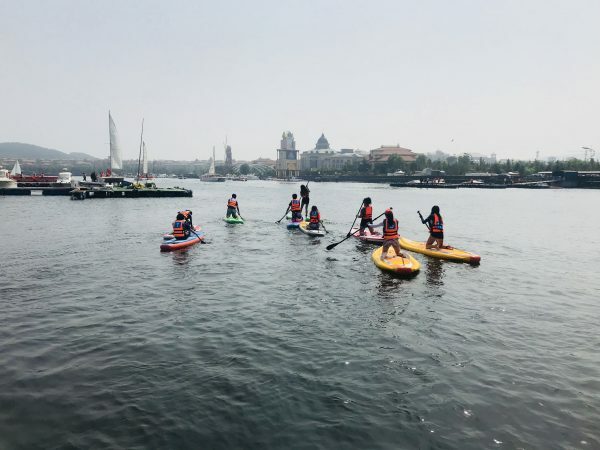 Dubbed the Dalian “Coastal Challenge,” this week long trip saw students exercising leadership qualities across various activities, fields, and locations that tested endurance, creativity, intellect, teamwork, and physical skills. 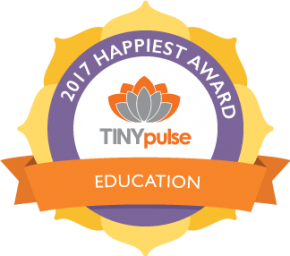 The program in Dalian took the students on a rollercoaster of challenges, encouraging them to work with one another towards common goals. After arriving in the port city and checking into their hotel, the group’s first task was to undertake a city wide amazing race/scavenger hunt. This challenging race had the dual effect of getting students to explore and become acquainted with Dalian, as well as getting them to work together in groups to answer questions about the city’s history. Without adult supervision, students had individual group activities for the race. Days 2 and 3 of the Coastal Challenge saw the group splitting into two smaller groups. Group A would drive out to the countryside to experience Manchurian hospitality, sleeping on “kangs” (the traditional beds that are heated in the winter). 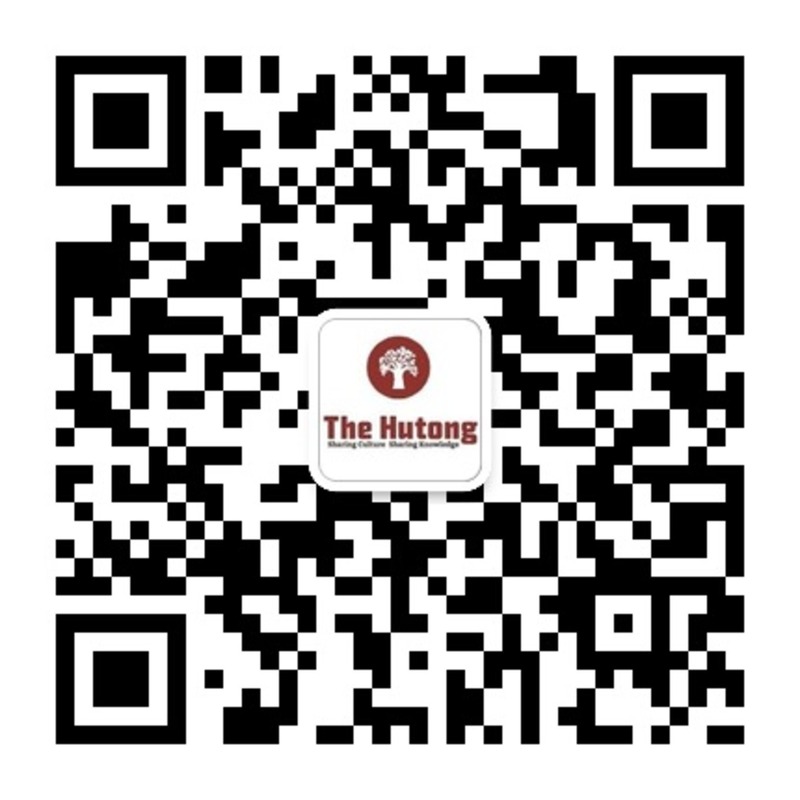 Group B would be heading to the nearby Xiao Ping Dao Marina taking part in rotational activities involving kayaking and stand up paddle boards. By having a rotating cast of activity leaders throughout the week, this gave different students chances to shine and flex their leadership “muscles” based on their strengths and areas that they were passionate about. The homestay group started their day by hiking up the nearby Xiao Hei Mountain 小黑山 taking in the dramatic views of the nearby scenery and learning about how the Manchus once ruled this land for almost 300 years during the Qing Dynasty. Upon descending and enjoying a delicious home cooked meal, the students checked into their rooms and then viewed a shadow Manchurian puppet show which was the inspiration for the evening’s entertainment when students created their own performance. After the show, the group went to a local market to buy ingredients for the night’s dinner. They were greeted by the infamous “Meat Mongrel” and vied for their favorite meats for their dishes. Post dinner performances were successful in the shadow puppet theater with each group performing a story focusing on Dalian and its history. 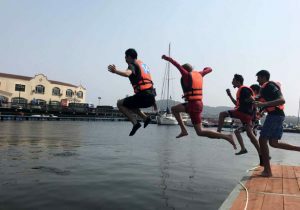 The water sports group had a later wake up and headed to the Xiaping Dao Marina 小平岛 where coaches would be waiting for them for the group’s rotations. After changing clothes and safety briefings, the group split up into two smaller groups focusing on stand up paddle boards and kayaking. 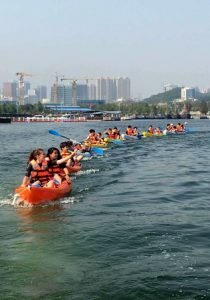 Needless to say, students enjoyed their time in the Dalian sun and got a bit wet during the stand up paddle boarding. Through relays and obstacle courses the students honed their skills in both sports. In the afternoon, after switching, an elite team of students, the DCSH “Navy Seals” were chosen to head out to sea in the somewhat “rougher” waters to view the coastline on their kayaks. Those students who stayed back had extra time with the stand up paddle boards. 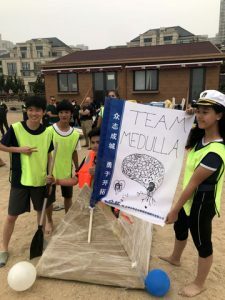 On the final day of the program, the two bigger groups reunited on the Xinghai beach for the intellectual challenge of building team boats out of cardboard, tape, and plastic wrap. Given little instruction, and minimal materials, groups were largely left to their own devices to create their vessels. Donning captain hats, each group’s “captain” helped to delegate roles and design their vessels. With names like the “S.S. Sinkable,” team “Urkel Circle,” and “Team Medulla,” all the groups finished building their vessels in the allotted time and selected lucky team members to launch and see if they were seaworthy. The groups lined the sand and cheered for their teammates as the vessels were pushed out. Even the teachers built a ship, a large cardboard canoe. Amazingly, 9 out of the 10 ships floated and the process ended in resounding cheers and laughter. The groups came back after floating in the cold Dalian surf and had a picnic on the beach.